Best budget tech products to buy in 2015 | What Hi-Fi? We're always on the look out for the best products on the market based on a strict performance per pound criteria. While the best kit around can cost a few quid, you don't have to spend a fortune to get excellent performance, with budget products becoming increasingly capable in recent years as component costs have come down. That's why we make an effort to cover products at the cheaper end of the spectrum in all the product categories we review. And with Black Friday, Cyber Monday and a host of Christmas deals around the corner, now is a good time to be on the hunt for a bargain. 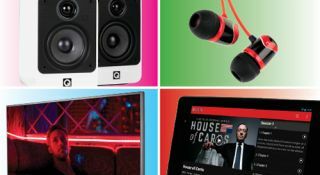 If you're looking to upgrade the free earphones you get with your phone or tablet, or looking to upgrade an old pair of in-ear headphones, then these five suggestions under £50 are the definition of a good deal. Headphones comes in all shapes and sizes: in-ear, on-ear and over-ear. With the use of mobile devices to listen to music soaring, more and more people are looking for worthwhile upgrades to the bundled buds. We've rounded up 10 of our favourite pairs of headphones under £100, which offer top-notch sound performance for the money. Speakers are essential for any hi-fi system. While many standmount speakers may look similar in design, the way they're built and the materials used can vary enormously. We've rounded up nine of our favourite pairs of speakers, all costing under £300, featuring entries from Dali, Cambridge Audio, Wharfedale and the award-winning Q Acoustics. It's crazy to think you can now get a great tablet for under £200 and some pretty good ones for around £100, but thanks to an ultra-competitve Android tablet market, that is now the reality. From the Google Nexus 7 to the Tesco Hudl 2, this is our round-up of the best tabelts under £200 – and some of the ones you should probably avoid. The TV remains the prime home entertainment source and therefore a product that you should purchase after plenty of consideration. Thanks to advances in TV technology and production methods, prices for LCD/LED screens have dropped in recent years. We've rounded up the best budget TVs on the market under £500, from small £200 models for the bedroom, to larger 40in models for the front room. MORE: If you want more choice, at a greater range of prices, then check out our best tech products to buy in 2015 page.